DUMBARTON beat Rangers 20s 2-1 to progress in the Irn Bru Cup at the YOUR Radio FM103 Stadium. DUMBARTON beat Rangers 20s 2-1 to progress into round two of the Irn Bru Cup at the YOUR Radio FM103 Stadium. Within two minutes Sons were in front. A foul by the visitors' Aidan Wilson right in front of referee Gavin Ross led to him pointing straight to the penalty spot. A few minutes later Rangers 20s had a chance to equalise from a free kick just outside the area after an infringement by skipper Andy Dowie. But the ball skimmed harmlessly into Scott Gallacher's arms. Rangers enjoyed a sustained period of pressure in the middle of the half, but Dumbarton pushed back and came close when a fine Kyle Hutton strike beat ex-Son Ross McCrorie, the Rangers captain, but crashed against the woodwork. On 72 minutes Ryan Hardie pulled a goal back for the 20s from a counter-attack, slicing through Sons defence. 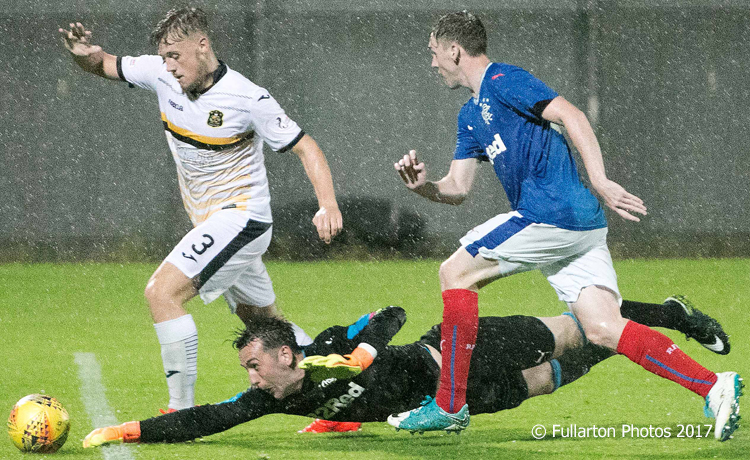 Rangers pressed for an equaliser at the end, but Dumbarton held solid to see out a well-worked 2-1 victory in this first round tie. The picture shows Chris McLaughlin beating keeper McAdams, but he then shot wide.